Cathedral our Lady of Victory Yaounde is near the roundabout of central post office, at the beginning of Boulevard du 20 mai. Base in heart of city center Yaounde, its an architectural building with capacity of 5000 people. Cathedral our Lady of Victory Yaounde has two pylons 30 meters on each side of the facade, bells on top of each. 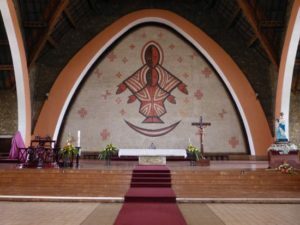 Equally its has a mosaic behind the altar that was designed by Reverend Father Engelbert Mveng, one of the first priests in Cameroon. You can also admire very pretty stained glasses made of broken glass bricks. Cathedral our Lady of Victory Yaounde has the honor of receiving Pope John Paul II in 1985 and 1995. Further she serves as the setting for the signing of the Post-Synodal Apostolic Exhortation “Ecclesia in Africa” ​​on 1995. As a result, a plaque immortalizes this day at the entrance of the cathedral. – Bishop Rene Graffin (1943-1961). An avenue of Yaounde bears his name. He is buried in Chevilly Larue in the diocese of Créteil in France. – Bishop Jean Zoa (1961-1998). He rests today, according to his will, at the parish cemetery of Mvolyé. – Mgr André Wouking (1999-2002). His grave is in the cathedral. – Monsignor Simon Victor Tonyé Bakot since October 18, 2003. Currently, Cathedral our Lady of Victory Yaounde is rules by His excellence Atanga bishop of Yaounde. 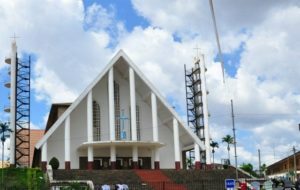 Outside near cathedral, there is several Catholics churches because 80 per cent of population in Cameroon is christian. Moreover, you will find in each neighborhood of the city Catholic churches performing religious services every Sunday. Some will offer the masses on weekdays for all those would like to pray. 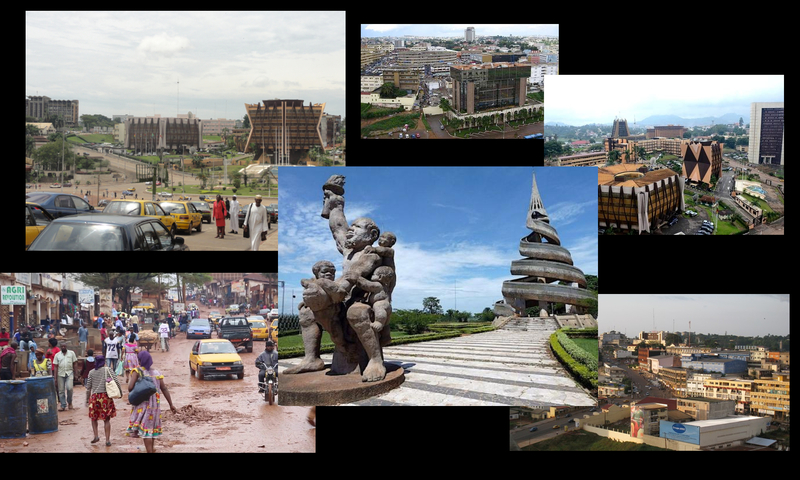 In addition to the Catholic religion, Cameroon also has a part of its majority Muslim people and in this context you have mosques throughout the city of Yaounde. The largest of these is the Tsinga Mosque, where Muslim people gather for their religious services on Fridays. I want to get across my gratitude for your kindness in support of individuals who need guidance on this one topic. Your very own dedication to passing the message up and down was really functional and have surely allowed associates much like me to reach their aims. Your valuable useful information means much a person like me and especially to my peers. Thanks a lot; from each one of us. Thank you so much for giving everyone remarkably spectacular possiblity to check tips from here. It is often so nice and packed with amusement for me and my office colleagues to visit your website a minimum of 3 times in 7 days to read through the newest things you will have. Not to mention, I’m at all times fascinated considering the eye-popping pointers served by you. Some 4 points in this posting are undoubtedly the simplest I’ve had. I enjoy you because of your own effort on this web page. Kim really likes making time for investigation and it is easy to understand why. Almost all hear all regarding the lively manner you produce very helpful guidance by means of the web blog and as well as strongly encourage participation from website visitors on this issue and our favorite girl is now becoming educated a lot of things. Enjoy the remaining portion of the new year. You’re the one performing a fabulous job.